As one of the top SMS marketing providers, we understand the importance of positive change. We’re always tinkering with our platform, trying to make it more effective and user friendly. 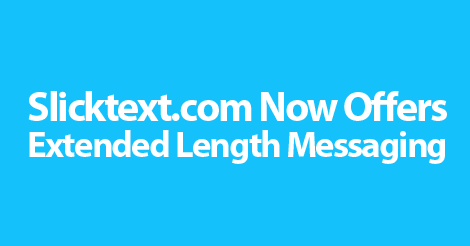 With that said, we want to let you, our valued customers know; we now offer extended length messaging. Need more than the standard 160 characters? No problem. You can now send messages up to twice that length. We even allow up to 1,200 characters when sending campaigns with a picture attached. Why did we add this functionality? Simple. When our customers ask, we answer. We want to provide an optimum experience. If you’re running out of characters, that’s no good. Your campaigns, offers, or announcements, shouldn’t be cut short. You should always have room to say what you want to say. Want to weigh in on new functionality? Shoot an email over to info@slicktext.com, and share your thoughts. We want our service to be superior to all other SMS marketing providers. But, to do that, we need your help. Don’t be afraid to share your new ideas. If you can dream it, chances are, we can build it. Partner up with top SMS marketing service, Slicktext.com. Give us a call today at 1.800.688.6290, or head over to the pricing page and sign up for your free plan. Our feature rich platform makes it easy for even the newest business owner to succeed. To top it off, our educational resources provide you with all the necessary information for beginners.